Convert M2TS, MKV, AVI, WMV, MP4, FLV to iPad Air/Mini (2), Apple TV in a fast way! Constantly update this software with enhanced functions, free to upgrade. 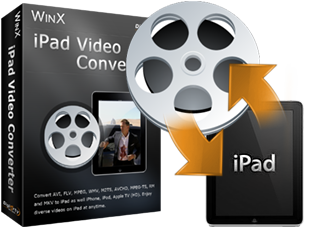 Buy now, enjoy high quality iPad video converter solution today. All-in-one solution to rip/backup DVD, convert MKV, MTS, MOD, TOD, AVI, MPEG, WMV, FLV, RM to iPad. Convert MOD, TOD, MTS, M2TS, MP4, MPEG, MKV, AVI, WMV, MP4, FLV, etc to iPad/iPad2/iPad3/iPad4/iPad Air/iPad Mini (New), Apple TV and Mac general video. A user-friendly iPad/iPad2/iPad3/iPad4/iPad Mini/iPad Air video converter enables you convert various video to iPad in outstanding quality and speed.